You could be forgiven for thinking the story concept for The Resident (also known as The Sublet in the US) sounds not unfamiliar – a mother and young child mostly alone in a new apartment with odd noises and things happening, it does stir memories of Dark Water and other such offerings. But Canadian film-makers Black Fawn are getting themselves a bit of a rep in horror circles (they also did The Bite which Garth reviewed on here last year), and there was something about this that sparked my Spidey-sense and told me this was going to be worth checking out, and so it proved, for while the main idea of mother and child in possibly haunted new home is far from new, The Resident plows a different furrow from others in that field, offering up a genuinely creepy, psychological approach. There’s a palpable sense of unease right from the start, just viewing the apartment, but once they move in the sense of disturbance grows. Much of the increasing sense that things just aren’t right comes from Joanna basically being at home by herself with the baby, day after day, in a strange city while her husband is out at his new job. She doesn’t know anyone here and, mysteriously, she never seems to bump into anyone from the neighbouring apartments coming or going. But she does hear them. Sometimes. A banging, banging, banging on the walls and other sounds. 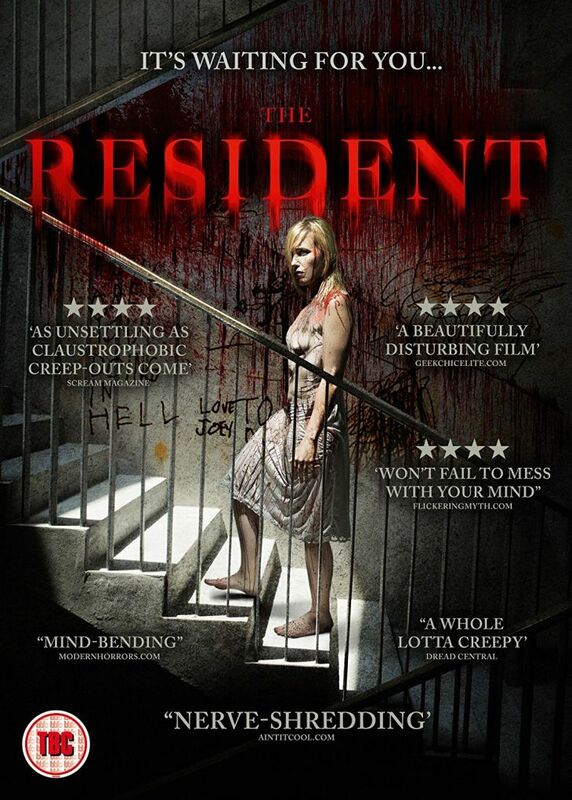 And I found this was the element that really made The Resident work for me – that real-world side of things, of Joanna trying to cope with her new life and baby and new home is something that is very easy to empathise with, and grounds the spookier aspects. In fact, it not only grounds them it also offers the viewer a dilemma – how much of the increasingly strange things that seem to be happening are real? And how many are the products of a woman in a heightened emotional state? And that really helps drive The Resident into a much more psychological level as the viewer is left wondering what is real and what is not – and realising that even if it isn’t real, the effect is the same on poor Joanna. And what if it is real, what are those noises from neighbouring apartments where nobody every seems to be home, what’s in that locked room, what happened here before… With a lean running time The Resident builds atmosphere right from the start and increases the psychological pressure throughout, not outstaying its welcome, so keeping the tensions nice and taught.